Excerpts from a speech given by Mrs. Smith at a meeting of the American Rose Society in Oklahoma City in 1940. In all the years during which I have been interested in roses and rose growing, this is one of the greatest honors which has ever been conferred upon me....being invited to speak in this beautiful city before this distinguished gathering of men and women, all of whom love roses even as I do. The honor is not to me alone, but to the city from which I come and to the KCRS, every member of which appreciates your giving me this opportunity. In our community it is generally known that the ARS is directly responsible for the development of rose growing in Kansas City, MO., and for the building of the Municipal Rose Garden. This was accomplished through the cooperation of Dr. J. Horace McFarland and Mr. Robert Pyle who was the secretary 10 years ago. I trust that you will forgive me for making this story personal. In 1929, quite suddenly I inherited a beautiful rose garden of 500 bushes. When the blossoms were at their height we would put a notice in the newspaper inviting the public to come see it. Some 1,500 would visit our rose garden at 814 Westover Road. Having been reared near Portland, Oregon (the City of Roses), and taking care of this lovely garden in the summertime for years, naturally I felt that I knew a good deal about roses. There were some replacements needed, about 50, which were purchased. The same gardener who had been employed for years helped me plant the roses. In about an hour we had them all planted and watered. They didn’t do well during the summer and by the end of the season, every one of the replacements had died. About that time, I had joined the ARS. When their book, What Every Rose Grower Should Know, arrived the first place I turned to was the diagram of how to plant roses. After studying the diagrams, I went out and pulled up the rest of those poor dead roses. They hadn’t had a chance ! Then I saw in the ARS Annual a list of rose radio talks to be given over NBC each week during March and April. I decided to invite a few friends to come and listen to the talks and have a cup of tea. Sometimes, it was difficult to get the hook-up. Usually seven or eight people came. Finally the time for the last talk came on April 30. The subject was to be Municipal Rose Gardens. I invited a lot of people, including the Park Department, representatives of the Chamber of Commerce, nurserymen and many good friends. Sixty-five in all. Everything was in readiness when a telegram came stating that on account of daylight savings time, the Rose Radio Talk would be at 12:30 instead of 1:30—luncheon time! The result was, with the help of my splendid friends, we served lunch. The talk came in beautifully. Then I stood in our living room and told our guests how wonderful a Municipal Rose Garden would be in Kansas City. How we could form a branch of the ARS and get their assistance. We could all work hard to build it. They agreed. 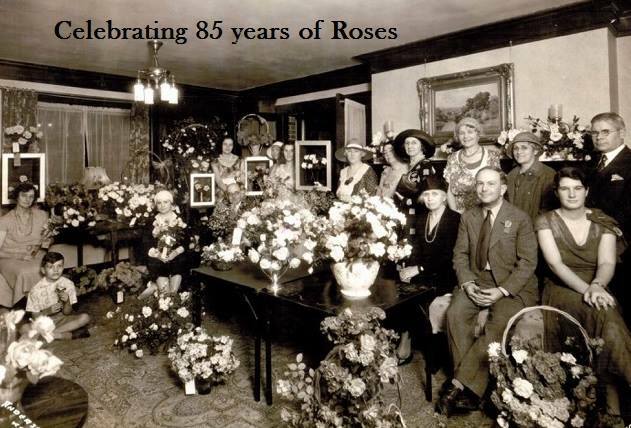 The following week, on May 9, 1931, the Kansas City Rose Society, a branch of the ARS, was organized. A special committee from the Rose Society met with the Park Department. We selected the lovely design of a rose garden drawn by Mr. S. Herbert Hare in the beautification plan of the Jacob L. Loose Memorial Park. One month later, on June 7, we held a rose show in our home. Some 1,200 people were amazed at the display of roses and the arrangements in the 30 shadow boxes that we had made out of apple boxes. Many of these people went out to the nurseries and bought bushes. One nurseryman told me he had sold 400 bushes as a result. That same afternoon, 200 gathered at Loose Park to dedicate the first unit of the Municipal Rose Garden which consisted of 120 bushes. The object of the Rose Society is to sponsor the Rose Garden in cooperation with the Park Department. The Society is governed by a board of directors. The membership is 265. Dues started with 50 cents, raised to $1, then $2. Many of the fine loyal members have worked right along with me from the first. The interest and help of everyone is needed in a venture of this kind. plant, water, spray and cultivate the garden. The Park Department maintains the garden and seems very proud of it. They are eager to please and show us every courtesy. The garden covers 1.5 acres of ground and has 6,300 bushes of 130 varieties. A lilac border surrounds the entire garden. The Park Department this week took out 24 iron archways and is replacing them with stone (1940). The main part is circular in form with a beautiful lily pool in the center which was donated by the KC Garden Club. The pool is centered with a statue—“The Spirit of the Rose Garden”—given by a friend. ‘Else Pousen’ roses border the pool. There are three circular walks and other walks dividing the garden into four sections. Four rose beds are in each section. The three pergolas were donated...on the east, south and west. The north entrance and pergola were built when the Park Department matched dollars with the Rose Society. The design is quite elaborate and our half of the expense was $2,675. It took ten years to accumulate enough money to pay our debt. Our finance chairman planned book reviews, travelogues, card parties and dinners. It was not until June 1 of this year (1940) that the last dollar was paid..not only the $2,675 but also for the 1,000 Polyantha bushes that are a part of the north entrance. There is one feature that I might speak of. It is our Memory Roses and Friendship Roses. Anyone paying 60 cents may have a Memory Rose for someone who has passed on. A Friendship Rose may be purchased for a living friend. Sometimes a person will be in the hospital and we will get a check for one or more bushes. Such news may very well create a desire to get well and to visit the garden. The one social occasion of the year is our “Rose Tea”...given for new members. We send out invitations and make it quite an event. Through the years, we find that we have to make our meetings very attractive not only for rose growers but to other people who love roses and the garden but who cannot actually grow roses themselves. At the beginning of the rose season each year, we set aside a day designated as “Rose Day”. This year Mayor Gage made a splendid speech. Mrs. Gage, the Board of Park Commissioners and their wives were guests of honor. We had a 40-piece orchestra, a chorus from the Conservatory of 20 voices and a group of dancers from one of the schools of dancing which added greatly to the occasion. One favorite song was dedicated to the Rose Society, entitled “In the Heart of a Red, Red Rose”. Little girls dressed as butterflies led Mrs. Jacob L. Loose, donor of the beautiful park, into her place of honor and presented her with a red rose. Five thousand people attended that day. It is at times like this that the Rose Society members feel repaid for their efforts and are glad to have a part in the object that gives so much joy and pleasure to others. I feel confident that the development of rose growing in Kansas City is the result of the demonstration made in the Municipal Rose Garden because hundreds of people not only from Kansas City but from the surrounding country go there during the season to enjoy and study the varieties of roses. Many teachers take their pupils there. I want to invite you to visit our garden at any time from May to October. It is situated in the northwest corner of the Jacob L. Loose Memorial Park at 51st and Wornall roads. Thank You. (Footnote #2: In 1965, during Mrs. Smith’s lifetime, the Municipal Rose Garden was officially renamed the Laura Conyers Smith Municipal Rose Garden. And in 2011, following her June death, Mrs. Aber was honored when the Rose Room in the Loose Park Garden Center was renamed the Sarajane S. Aber Rose Room.